And we couldn't be happier. I didn't want to say this in my previous blog posts, but I was very worried about the prospect of having a boy. That being said, my stomach was in knots when I went for my sonogram appointment this morning. No worries though, because we are soon going to be parents of two sweet little girls! I'm also excited to be able to use all of Holly's clothes again. In fact, as soon as I'm finished typing this post, I'm going to pull out her tiny newborn clothes and start getting them ready for the new baby. I'm very glad that Holly will have a little sister to be pals with. A drawback, though--now we have to start getting serious about this naming business. Believe me, it will probably take until October to come to some sort of agreement about a name for this baby. I think it's so stressful to come up with a name for a real, live little person. Anyone else with me? Or do you all get excited about naming a new arrival? I can hardly believe my baby is a year old! The past year with her really flew by. It's scary how quickly it went. We enjoy her more and more every day. We had a family barbeque and some banana cupcakes to celebrate. I think everyone had a really great time--I know we did! Holly was extremely skeptical of her cupcake at first, especially with the candle. We actually couldn't find a lighter in the entire house and Holly was going crazy for her cupcake, so Andrew was resourceful and lit it using our grill. After she realized how tasty it was (if I do say so myself), Holly dug right in. She was a happy girl! Time to open presents! Holly got the hang of opening gifts quite quickly and really had a lot of fun with it. Please excuse my misshapen self in these pictures. I happen to be in ninety percent of them, since Holly was sitting in my lap. Although Holly loves all of her birthday presents, this Elmo doll holds a special place in her heart. She never lets him get too far. She will even say his name, which sounds like "Ah-do" and makes me want to die, it's so sweet! She will also say "mama," "dada," and "uh-oh." She tries to say lots of other things, but unfortunately it all pretty much sounds the same to my adult ears. She will also fold her arms when we say a prayer, and I'm trying to teach her to say "Amen" when the prayer is over. Right now when I ask her to say "amen," she folds her arms again and gives me the sweetest little smile. It makes my heart melt. Our little girl is learning so much! It's so fun to be her parents and get to participate in everything with her. And a big thank you to our family who shared her birthday with us. It's funny how strong your opinions about food are when you're pregnant. 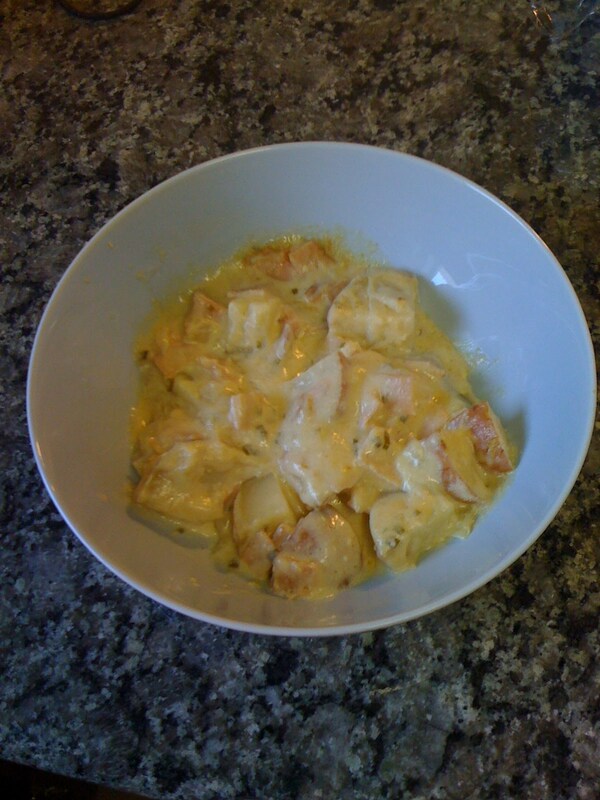 When I was pregnant with Holly, I couldn't stand the sight, smell, or taste of King Ranch Chicken. The mere thought grossed me out. This pregnancy, I have not met many food aversions yet (although I have not summoned the bravery to try King Ranch Chicken). But I had been craving this casserole for quite some time. When we finally got our kitchen back, I made it two weeks in a row! It has become one of my favorite casseroles. Oh, and by the way, sorry about the picture. I know it's totally unappetizing, but I have big opinions about recipe posts with no pictures. We dug into the casserole and I was putting the leftovers away before I realized I had not gotten a picture. Oops! That said, don't let the picture turn you off--this casserole tastes wonderful. Preheat oven to 350. Grease a 2-quart baking dish; set aside. For sauce, in medium saucepan cook onion in hot butter over medium heat 5 minutes or until tender; stirring occasionally. Stir in flour and mustard. Add milk all at once. Cook and stir over medium heat until slightly thickened and bubbly. Reduce heat to low. Whisk in cream cheese until smooth. Gradually add 1/2 cup of the swiss cheese until cheese is melted. Stir in chives. Bake, covered, 1 hour or until potatoes are tender. Uncover; sprinkle with remaining cheese. Bake, uncovered, 10 to 15 minutes more or until cheese is melted. Let stand 10 minutes before serving. This recipe is one of our favorites, especially now for me! Give it a try and let me know how you like it.